The Vistani have long been masters of fortune telling. In the hands of a Vistani seer, tarokka cards can tell tales of the future and provide answers to many a dark and mysterious question. "Many doors will be opened, many secrets will be revealed. Don't ask me how or why, just follow the message of the cards. 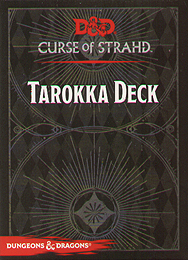 Includes 54 Tarokka cards, handy for a trek through Barovia, as well as Prophet's Gambit, a card game for 3-5 player.